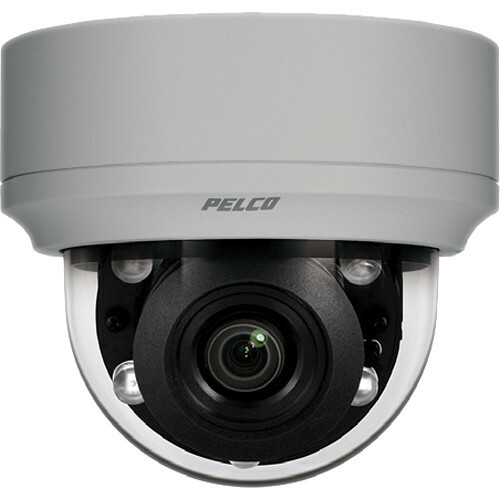 Keep a sharp watch on your premises with the Sarix IME 2MP Outdoor Mini Dome Camera from Pelco, at video resolutions up to 1920 x 1080. Featuring SureVision 3.0 technology, this camera combines simultaneous 130 dB wide dynamic range, low-light capability, and anti-blooming to handle challenging lighting conditions, such as mixes of bright areas, shaded areas, and intense light. The built-in IR cut filter can be set to automatically switch to night mode as light levels drop, boosting IR sensitivity and allowing the camera to deliver high-quality black-and-white images during nighttime. Additionally, adaptive IR technology gives the camera the ability to react dynamically to its surroundings and provide illumination needed to capture detail up to 98' away in dark environments. The Sarix IME uses a motorized varifocal 3-9mm lens with autofocus to give you remote control over the camera's field of view and the ability to enlarge a scene while staying in focus. A built-in SD slot allows for up to 128GB of onboard storage so you don't have to worry about losing crucial footage in the event of network loss. Bandwidth and storage efficiency are optimized without compromising video quality using H.264 and MJPEG compression. Designed to be easy to install, the camera can be powered directly via the network connection and is ONVIF-compliant to ensure compatibility with a wide range of surveillance devices. The camera's housing is IK10- and IP66-rated to withstand impact, corrosion, dust, rain, and snow. SureVision technology delivers HD resolution, consistent color, fast processing power, and advanced low-light performance with simultaneous wide dynamic range (WDR) and anti-bloom technologies. Also featured are 3D noise filtering, smooth response to illumination changes, and improved tone mapping to retain color accuracy and overall image contrast. Designed to install quickly, the camera includes autofocus, motorized zoom, built-in analytics, and other advanced features needed for demanding security applications. This Sarix IME Mini Dome comes with an integrated varifocal 2 MP autofocus lens with a focal length of 3-9mm. Designed for outdoor use, it is housed in a sturdy enclosure that is both vandal- and tamper-resistant. It can operate in a wide range of environmental conditions. Four advanced autofocus options are included: temperature change (every 9°F), day/night transition, a daily autofocus routine, and manual autofocus. These options ensure clear, focused images regardless of the scene or environment. All autofocus options are available through the web UI. Two independently configurable video streams are supported, in addition to a service video stream. The streams can be compressed in MJPEG and H.264 formats across several resolution configurations. The camera offers real-time 60 fps video with full HD resolution up to 2 MP using H.264 compression for optimized bandwidth use and storage efficiency. The streams can be configured to a variety of frame rates, bit rates, and group of pictures (GOP) structures for additional flexibility in bandwidth administration. In addition, streams can be encoded as constrained variable bit rate (CVBR) or constant bit rate (CBR). Analytics enhance the flexibility and performance of Sarix Enhanced range cameras. Eight behaviors are preloaded and included as standard features. These behaviors can be configured and enabled using a standard Web browser, and they are compatible with VideoXpert, Endura, and third-party systems that support alarms using Pelco's API. Analytics behaviors can be scheduled to work during a certain time or condition. For example, during the day, a camera can be configured with Object Counting to count the number of people that enter a lobby door. At night, the operator can change the profile to Camera Sabotage to trigger an alarm if a camera is moved or obstructed. The eight preloaded behaviors are called Abandoned Object, Intrusion Detection, Camera Sabotage, Wrong Direction, Loitering Detection, Object Counting, Object Removal, and Stopped Vehicle. Sarix Enhanced range cameras are designed with Power over Ethernet (PoE), 24 VAC, and 12 VDC to reduce costs and simplify planning, wiring, and installation. PoE functionality works with PoE-enabled network switches or power injectors, eliminating the need for separate power supplies and cabling, and increasing camera fail safety through an uninterruptable power supply (UPS).